Hope you’re enjoying your summer as well! Below are a few things I like to keep in mind when managing customer service on social. Have any more to add? Recognize in a timely manner. Even if you are unable to quickly answer someone’s question or concern, make sure you at least say you’ll get back to them. This way, they know they’ve been heard and will, hopefully, stay patient. Find a solution. After letting the customer know you’ve heard them, now it’s time to find a solution for them. Act as their partner, rather than someone behind the glass. Asking questions is a good thing, but try to think of all the questions that will give you the right information you’ll need rather than going back and forth. This will save you both time. Take it offline. If the conversation is becoming heated or is taking to many back-and-forth public messages, take it offline. Your community will be happy you did as this could cannibalize message streams. Once they’ve received the necessary information, think about posting to the message stream where the convo all started so that other community members can benefit and see a resolution. Compensate. Prepare an arsenal of treats. Ask your manager if you can give out coupons codes, free samples/products, etc. when necessary. Of course, these should only be used in the right situation. So, put together a document outlining when it’s deemed appropriate. Record. Remember to track these customer questions and issues so you can determine trends, prepare FAQs, social content, etc. This tracking will also help every team in the organization. For example, if there’s a functionality that’s causing customers grief, you can send this trend over to the developers so they can improve the product. 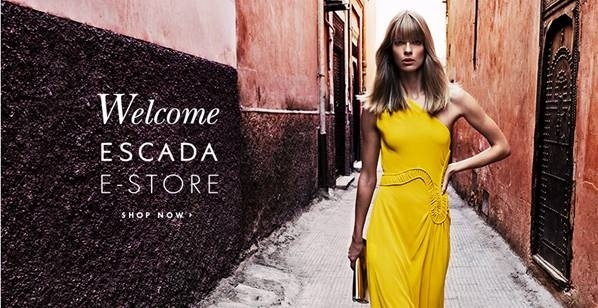 Luxury fashion brand ESCADA will launch today its online store in the United States of America, following the successful introduction of ESCADA.com to the European markets in 2013. Welcome to the 21st Century, ESCADA! The E-Store will offer a wide range of ESCADA lifestyle products, including apparel and accessories from the ESCADA and ESCADA SPORT brands. Usability and design is likewise important in the ESCADA E-Store. The navigation is easy and intuitive; the elegant design with large-scale images reflects the ESCADA brand identity. And check this out: All social media channels are integrated into the new online store. The site, which is optimized for mobile applications, ensures an ideal display on all devices. Remember readers, always keep in mind mobile. You’d think it’s a no brainer, but many companies forget all about optimizing and scaling for different devices. The store finder is placed on all relevant ESCADA E-Store pages and is supposed to stimulate multichannel experiences. In selected ESCADA retail stores sales staff will carry iPads to directly assist clients in placing orders in the E-Store for items that might not be available in the store. The ESCADA online store provides a variety of different shipping options via Fedex, including free standard ground shipping as well as express shipping. Furthermore, the ESCADA E-Store offers its clients an easy and cost-free returns handling including a 14-day return policy. An exclusive packaging concept completes the range of service offers of the ESCADA E-Store. Hermes NexTec, specialist in international full-service e-commerce solutions, provides all services along the online value chain including shop, content and IT management and in close collaboration with ESCADA performance marketing. In addition to these services Hermes Fulfilment supplies with warehousing, customer care, finance services and returns management. Lightning in a Bottle happens Memorial Day Weekend May 22nd-26th at the San Antonio Recreation Area in Bradley, California. Music, art, yoga and more… everything you need to recharge your mind and body. As a street teamer for the festival, I’m always spreading the good word. This festival will put a perma-smile on your face 🙂 And if you aren’t familiar with LIB, you might be with The Do LaB, the folks that support Coachella by featuring up-and-coming electronic acts on their own stage – and, of course, the famous water hose to cool off. Tickets are on sale now: lightninginabottle.org. Get them now and listen to a few of my favorites: Gramatik, Phantogram, Little Dragon, Moby, The Polish Ambassador, Sugarpill, Chet Faker, Baauer (for funsies) and Cashmere Cat. But I can’t wait to discover more music from the lineup!